It is so hard to find a reliable strategy these days. When you look for great systems you will often find them at very expensive prices. Other systems on the other hand may be good, badly made, or just simply bad. When it comes to looking for an ideal system you may rely on the EUR/USD simple system. This system is simple and it also comes with easy to understand explanations. This system was originally made for Forex trading and be readily used for Binary Trading. KNOWING MORE ABOUT THE EUR/USD SIMPLE STRATEGY! 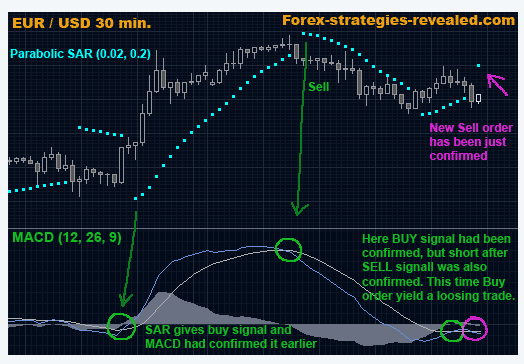 This simple strategy makes use of two popular indicators. The strategy’s author stated that it can be used for specific pairs but it can also be used to just commodities, stock indexes, and currency pairs. This system relies on Parabolic SAR’s signals for buy and sell that are MACD confirmed. The author makes use of basic settings for the two indicators. It also makes use of thirty minute chart bars. If you use it, it is best to use it at eight in the morning to twelve noon time once London and New York sessions overlap. USING THE EUR/USD SIMPLE STRATEGY! This strategy is so simple to use. The signal’s first half is generated from Parabolic SAR. When the Parabolic SAR provides a signal for buy and sell you have to prepare for trading in that direction, be it bearish or bullish. Once the MACD verifies that signal, that’s when the real buy or sell signal enters. Once the parabolic SAR shows buy signals the MACD has to cross zero line from a lower level in order to verify. Weaker MACD signals should not be taken. Zero line crossovers are the ones that need to be taken. This goes true in revere. Once a sell signal is provided by the parabolic SAR you have to wait for the MACD zero line to cross from the top in order to verify it. If there are no confirmations, then there are no trades. Another great addition to the strategy is that it also offers some exit tips. These may not be fully useful for binary options but it can bring you to other ideas. You can see exit signals when the MACD crosses again below zero line. However, you cannot use such sell signals along with binary options but you can use it in some other ways. With a sell signal, you can have a chance to use a straddle technique that can lead to winning trades. WHY IS EUR/USD SIMPLE STRATEGY GOOD? The fact that it makes use of trusted and reputable indicators makes it a reliable system. It is quite good because it needs confirmation and makes use of more than just indicators. It is good because you can use it on different currency pairs. The SPX also seems to work too. It is also good because it uses different times frames. It brings signals for straddling and hedging. Moreover, this strategy exemplifies the essential characteristics that you may consider very important in a good strategy it relies on the meeting of indicators for signal generation. WHY IS EUR/USD SIMPLE STRATEGY NOT GOOD? There are many reasons why this is a not so good strategy. The first thing why it’s bad is that it does not fully consider trend. If there were some contemplation towards trend or even signal convergence in one or time frames it will lessen some problems. MACD here is an indicator that allows lagging. When you wait for the zero line to cross for verification, you may be kept out of successful trade. If you trade with trend, a weak MACD signal may be handles but with lesser success rate. The second reason why this strategy is bad is that the fact that it has no regard for trend, the system will produce signals that may counter the trend. These counter trend trade may be quite profitable but in most cases it may lead to losses. Because of its lags, it may not be a very advisable strategy for contrarian trading. Generally, this is a great strategy. It offers user friendly signals. These signals are easy to read and area very clear. You can also easily apply it to binary options. If you want better results you may use in together with other techniques that determine trends. This way you can filter traps and poor signals. Among the most fundamental rules of trading is trading with trend. No strategy must overlook this. This strategy is ideal for an amateur trader who likes to trade in shorter time frames. It may also be ideal for novice traders who have knowledge on trend identification.